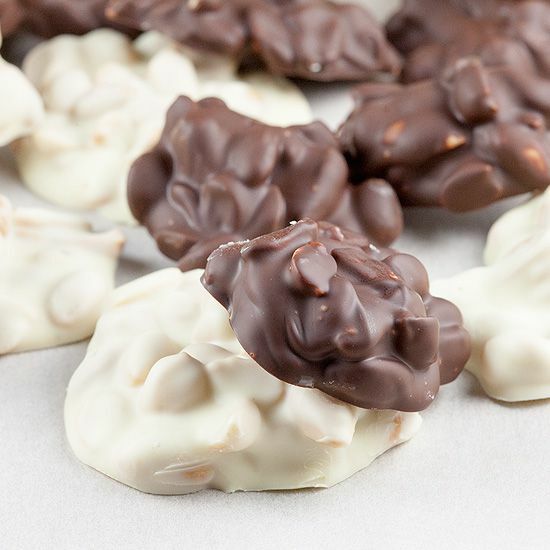 Dark and white chocolate peanut clusters are quite fun and easy to make. This recipe also teaches you how to melt and temper chocolate! We’ve put up a good video on how you can melt and temper chocolate below. It’s a lengthy video, but if you want to learn how to properly melt and temper chocolate we highly recommend watching it start to end. Skip this video if you already know how to temper chocolate. ADD water into the large pan, bring to a boil. PLACE the aluminum bowl inside the pan. This method of melting chocolate is called “au bain Marie”, it means that you melt chocolate without burning. If you used a chocolate bar like us, break it into smaller pieces. ADD into the aluminium bowl when the water is boiling. 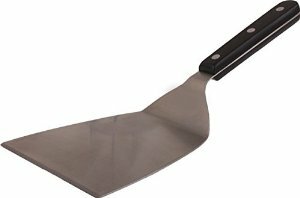 MELT the dark chocolate while gently stirring with one of the silicone spatula’s. POUR the melted dark chocolate onto the marble slab. TEMPER the dark chocolate, add back into the aluminium bowl and mix together with the melted chocolate that was left inside the bowl. Return to the large pan to melt a little more for one minute. REMOVE the bowl from the pan, quickly wipe the underside of the bowl with a clean kitchen towel to prevent water from dripping. ADD 200 grams of unsalted peanuts into the melted dark chocolate, stir using the silicone spatula and coat well. 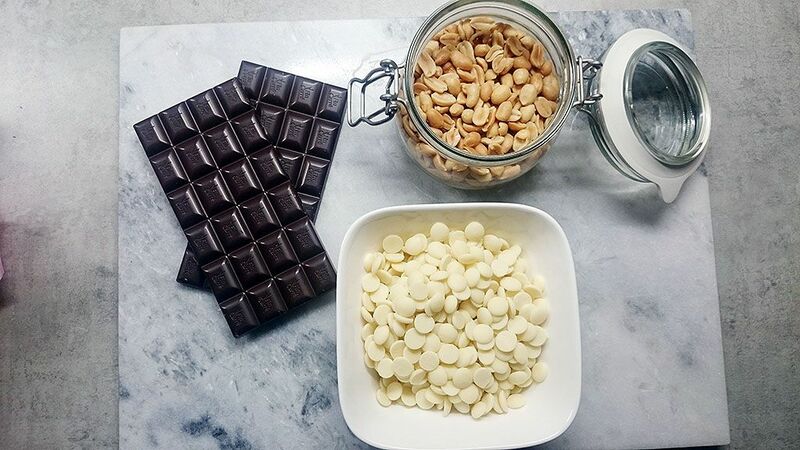 USE a tablespoon to scoop out one tablespoon full of dark chocolate and peanuts, pile that on the pre-lined baking sheet, don’t touch it again. REPEAT until the bowl is empty. REPEAT this step for the white chocolate, but skip the whole tempering part since white chocolate isn’t actually real chocolate. 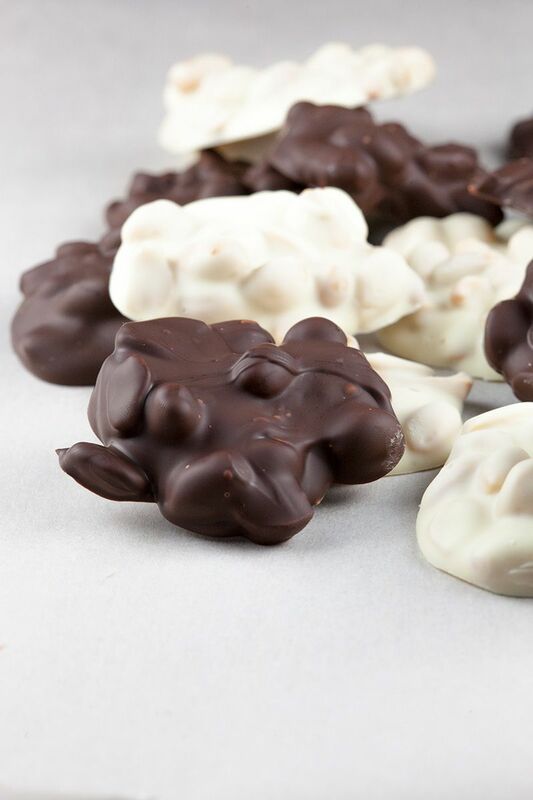 STORE the chocolate clusters in a cool room, a temperature of 15 degrees celsius or 59 degrees fahrenheit would be ideal. We used our un-heated basement for this. 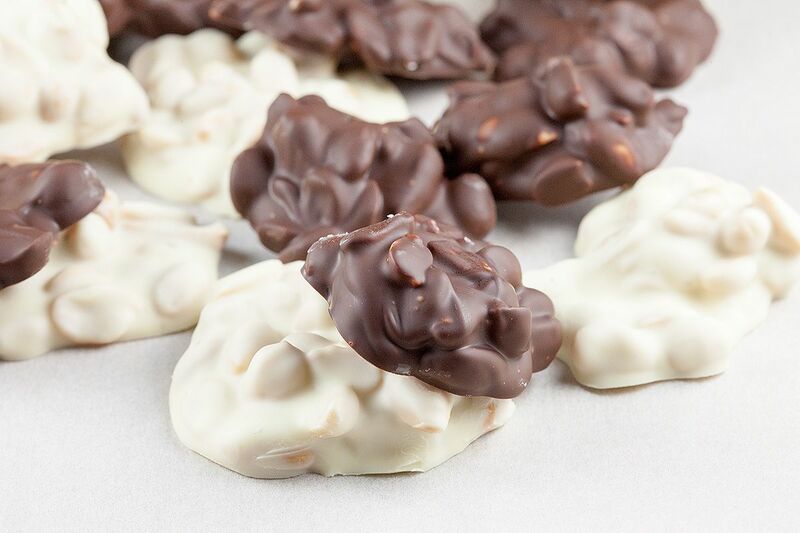 If you refrigerate the chocolate clusters they can get a white-ish look surface instead of a smooth one. COOL for at least 1 hour before eating them, enjoy!